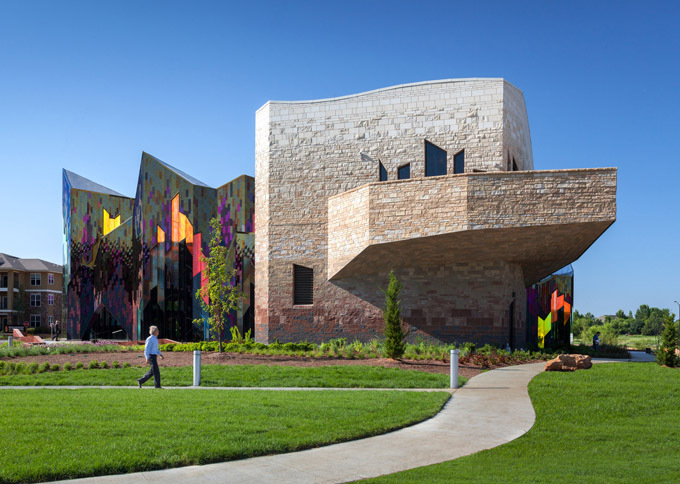 Verner Johnson designed this impressive museum building situated in Overland Park, KS, United States, in 2014. Take a look at the complete story after the jump. 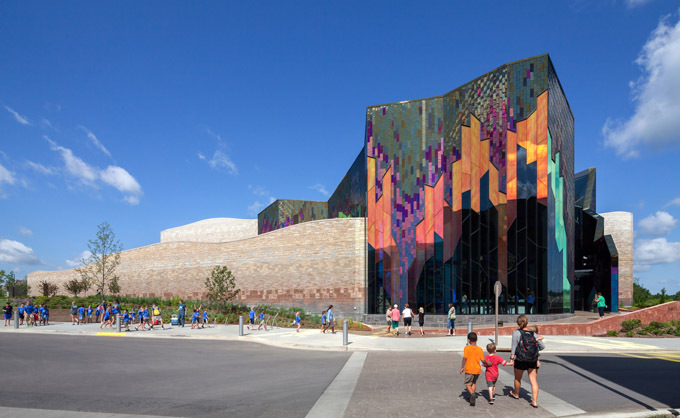 From the architects: What benefits can a museum design bring to the fragmented, undistinguished and often criticized environment of new suburban sprawl? 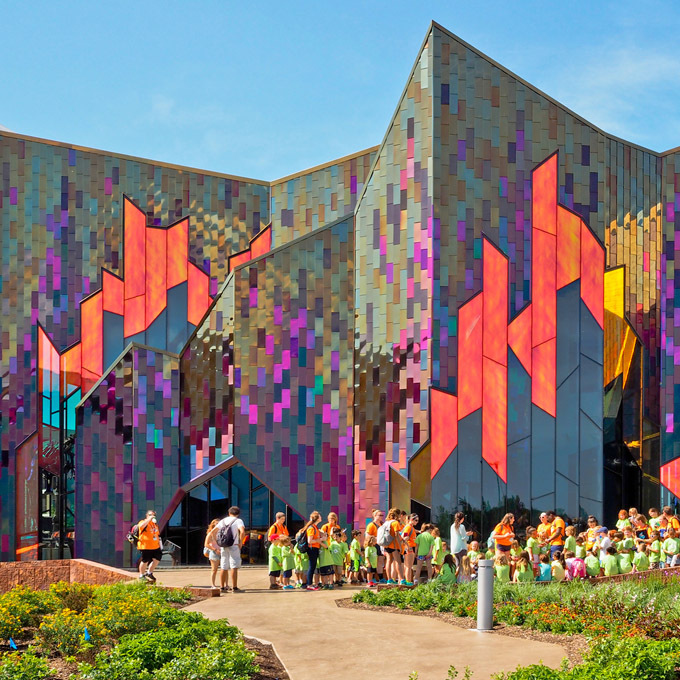 In addressing this challenge, this project uses architecture to package the latent social potential of the museum typology in a way that redefines the suburb. 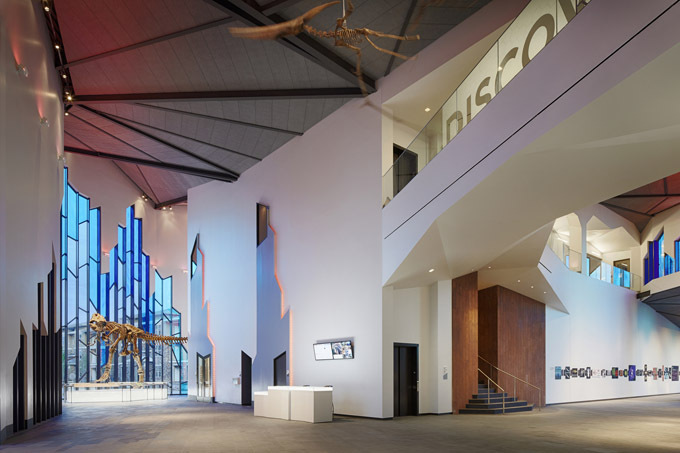 By symbolically embodying the story of the region and emotionally engaging people with its architecture, the Museum is the vehicle to spiritually connect people to where they live, giving the suburban environment a sense of community. 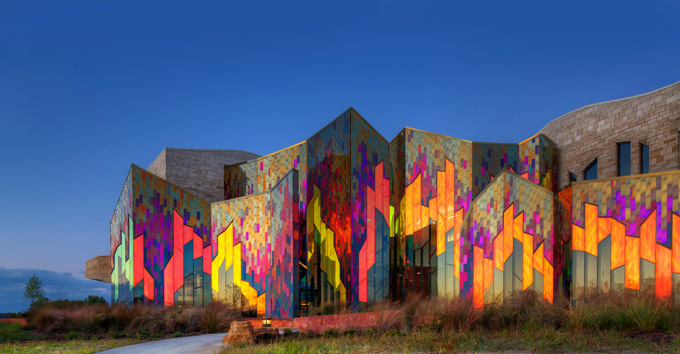 The design concept evokes the imagery of one of the most unique aspects of the local Kansas region: the tallgrass prairie fire burns. From sitting, to massing, forms, materials and detailing, all design decisions cultivate this concept. 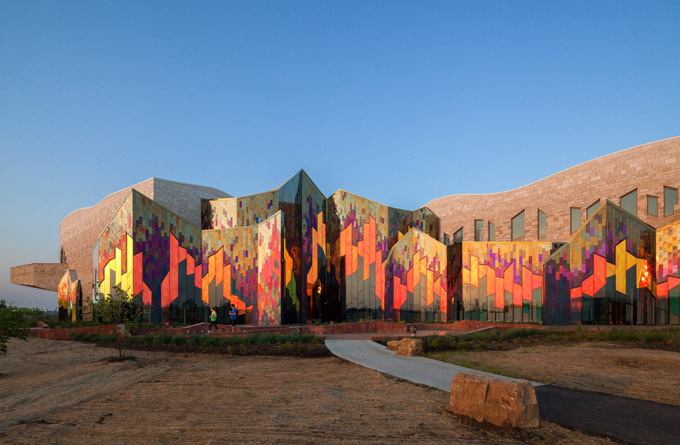 Rolling ‘hills’ of stone form the background landscape for vibrant ‘lines of fire’. 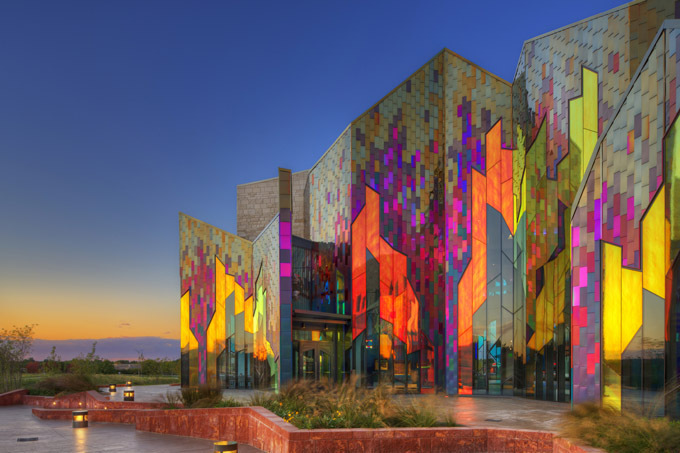 Materials dynamically shifting in color and reflection bring these fires to life: multi-colored iridescent stainless steel panels mixed with innovative dichroic glass. 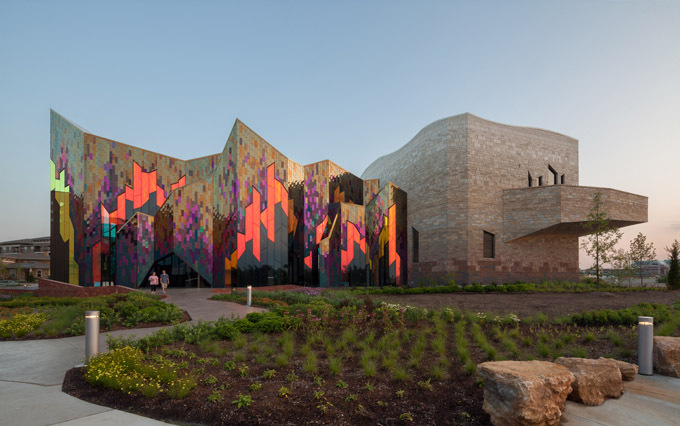 Set in a wetlands park directly off the main thoroughfare, this Museum is the signature building of a new 60-acre live-work-play development. 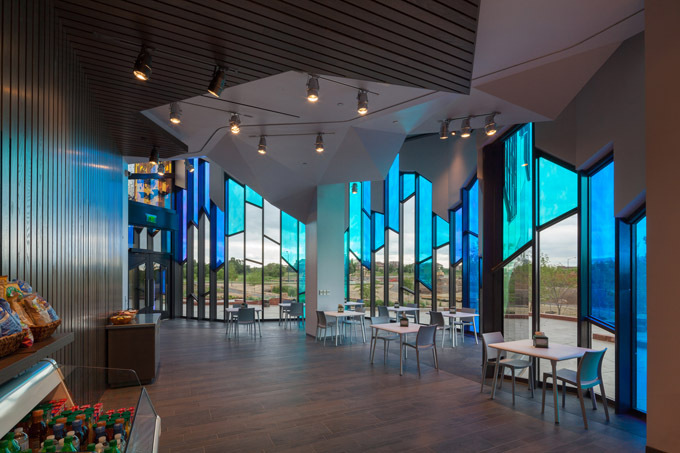 The project’s LEED Silver Certification attests to its environmentally sound design and construction practices, echoing the architectural concept rooted in sustainability – the preservation of the tallgrass prairie ecosystem. 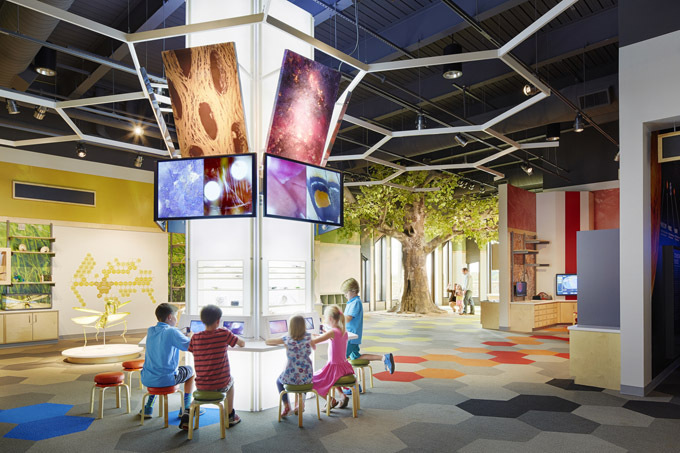 The Museum was designed as a civic hub featuring world-class traveling exhibits from the American Museum of Natural History. 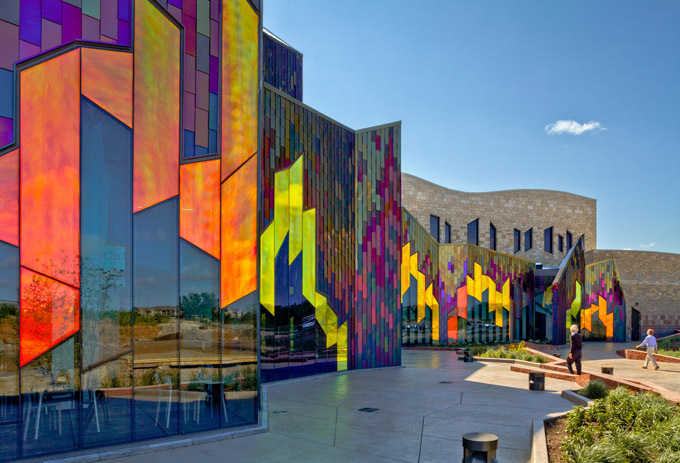 By engaging the local population in broader cultural and scientific experiences, while architecturally celebrating the rich story of the region, the Museum grounds it within a larger context and forges an identity for the suburb. 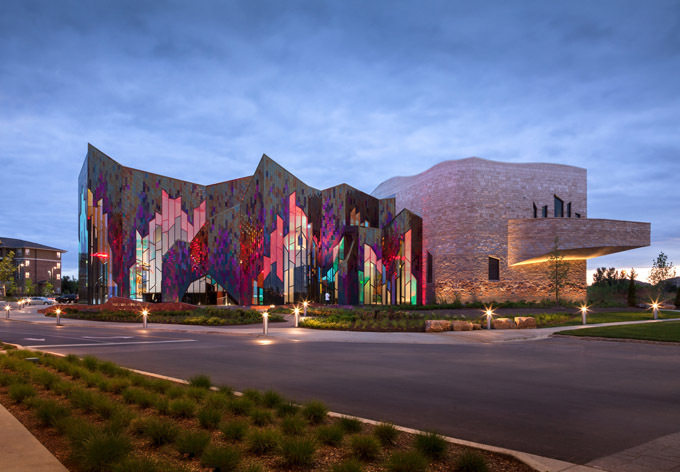 The design boldly contrasts with the surroundings but touches the sensibilities of the locality by orchestrating distinctive materials, forms, and technologies to produce a new and provocative regionalism. 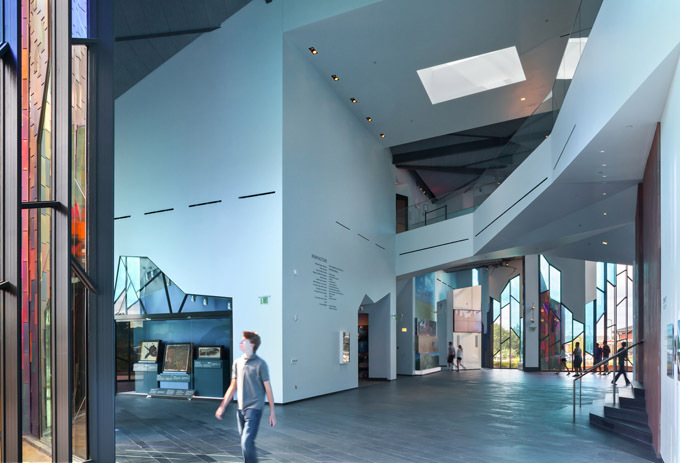 To overcome the challenge of enticing visitors during down times between traveling shows, the building itself becomes an exhibit. 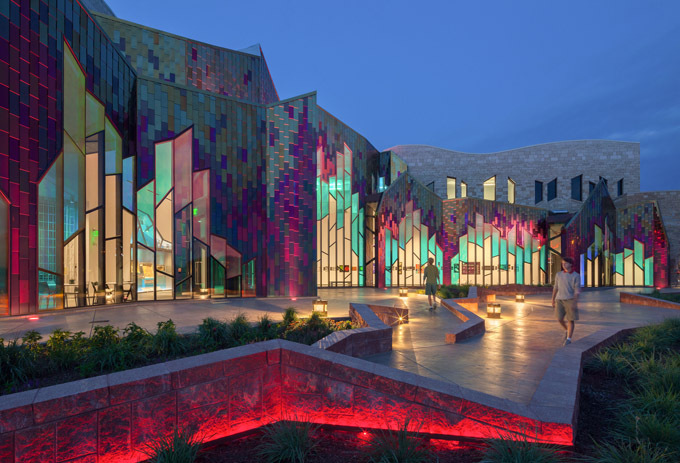 The colorful and sculptural design reinterprets regional stone practices, celebrating the natural stratification of the local fossilized limestone. 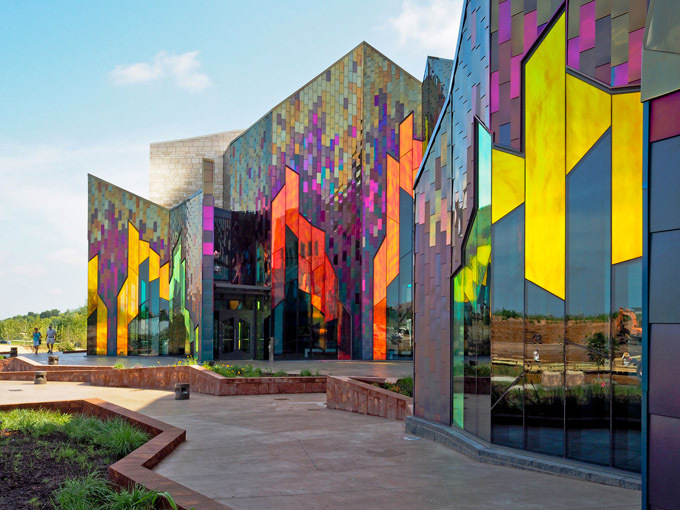 Color-shifting LIC (Light Interference Color) stainless steel panels are designed in a gradient from blue to gold, echoing flame bursts and sparks. 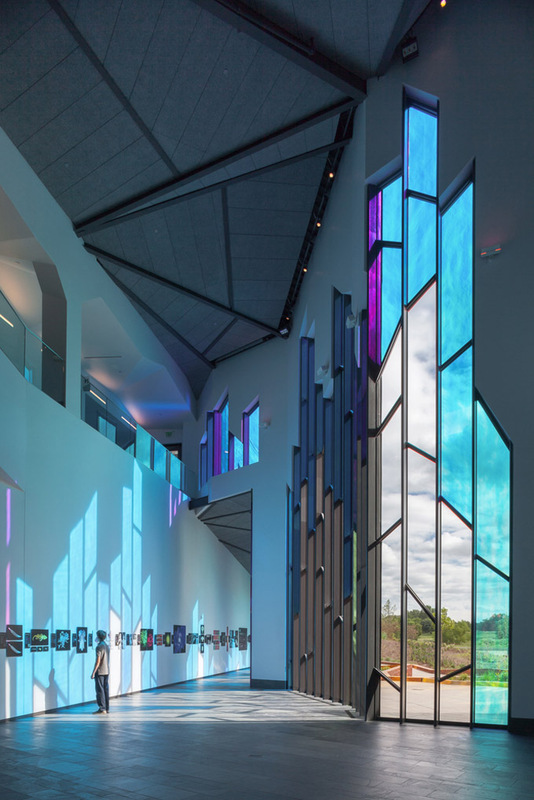 The cutting-edge insulated dichroic glass was developed exclusively for this project and is considered the first North American application. Its unique color-changing and reflective properties give people the illusion of being engulfed in flames. 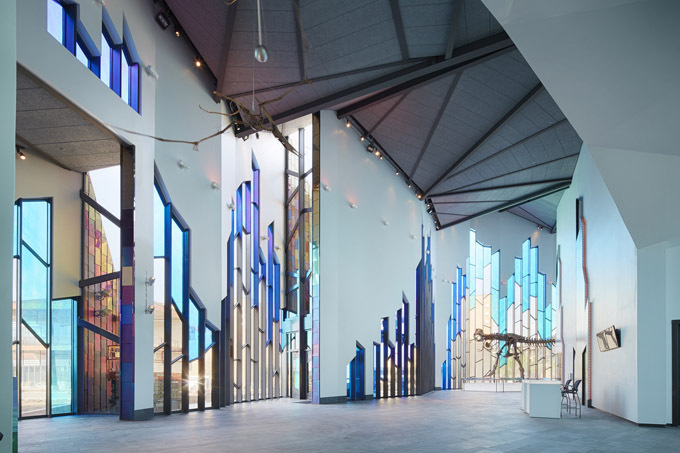 In contrast to the vibrant exterior, the column-less, cathedral-like interior, coupled with calming blue and purple dichroic-transmitted light, imparts a peaceful sense of awe. 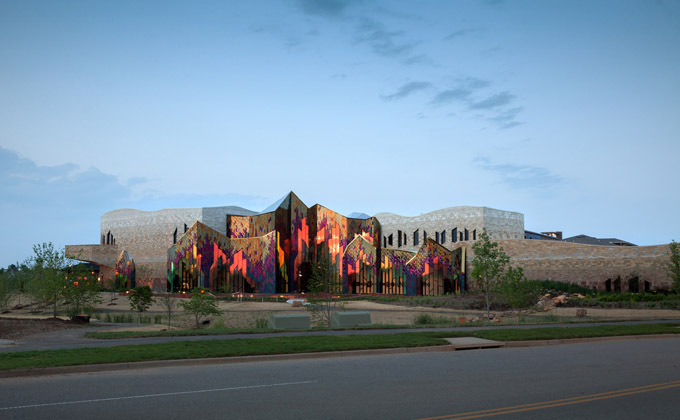 The exterior wall system innovatively fuses structural steel frames and veneer curtain wall into a single thin custom system, evoking the ephemeralness of fire.Exposed roof beams and grey tectum panels create swirling smoke forms at the ceiling. 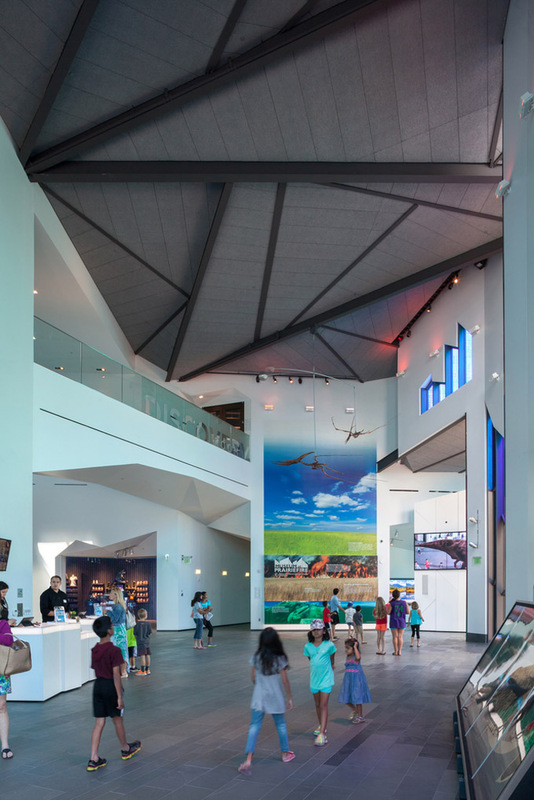 Exhibits throughout the lobby, the children’s hands-on Discovery Room, and the café setting overlooking the wetlands provide activities between traveling shows. This design does not accept and conform to the shortcomings of suburban sprawl. 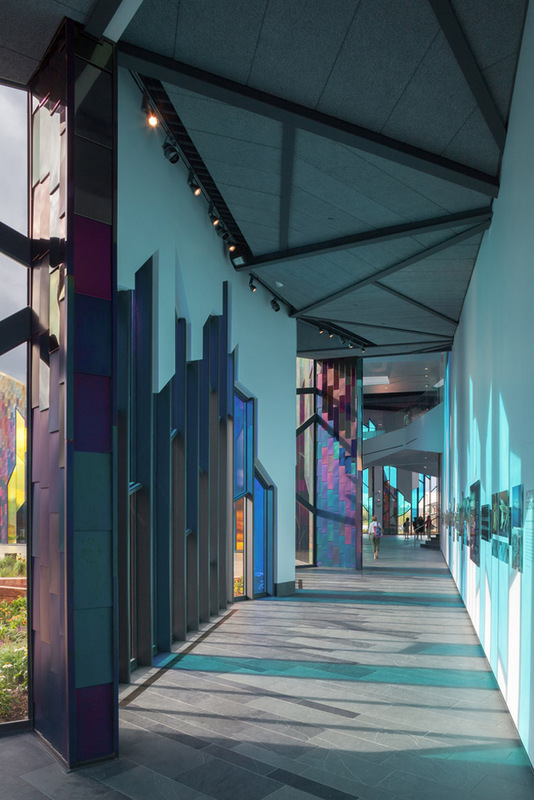 It defines the environment’s unique identity, forges emotional connections between the people and the place, and allows the suburb to become a proud, independent and sustainable community.